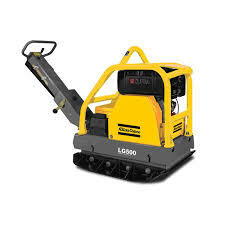 Atlas Copco LG500/LG500 Forward Reversible Plate Compactor rental is available in Rochester NY, Ithaca NY and Upstate NY from the Duke Company. Atlas Copco stands by their responsibilities towards their customers and towards the environment. They’re performance stand the test of time. This is what Atlas Copco calls: Sustainable Productivity. Their compaction equipment not only for ease of use, but also to be easy on the operator, by incorporating low-vibration handles and balanced weight distribution for simple maneuvering.